KabuNohi Sorake is a ‘hand-made resort’ and the first upscale resort in Nias. 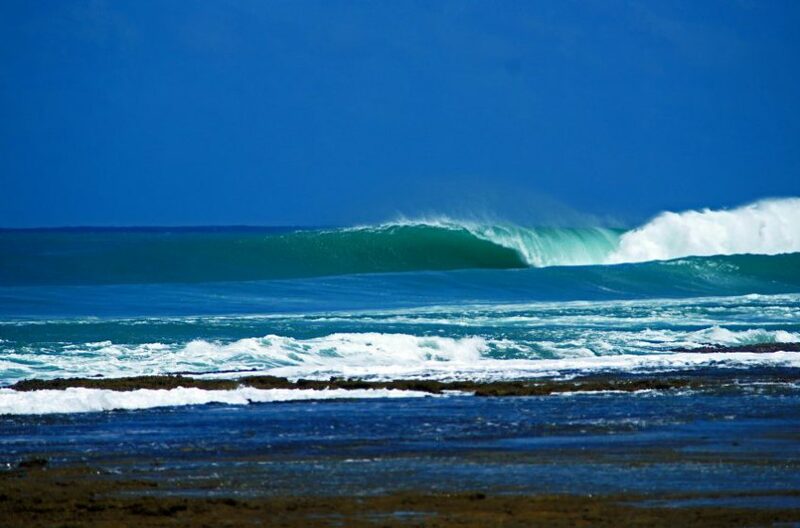 It is located on Nias Island with the world class waves of Lagundri Bay at your door-step. As you enter the front gate of KabuNohi Sorake you instantly feel like you’ve entered a very special tropical oasis. The unique building structures, local artifacts and unique landscaping offer an instant impression of paradise and the quality of the resort is immediately obvious. The name Sorake (Zorake), in Nias language means “broken coral rocks”. KabuNohi Sorake is absolute beachfront and the coral sands are pushed up the beach to their retaining wall by the breaking waves, The oceanfront garden area has a large and private viewing deck that is a great camera spot covering the view directly up the length of the point, and the 3 wave sections with the Rice Bowl Peak, directly out the front), Kiddies Corner, and the Main Nias Break. This deck is the ultimate place to hang out in between surfs or relax on sunset with a cold beverage. Non-surfers will enjoy this relaxation area as much as the surfers with some shaded areas to relax in a deck chair with a good book whilst catching the sea breeze and checking out the surf action beyond. KabuNohi Sorake meets the higher standard requirements of couples, families and discerning surfers looking for quality accommodation, the highest quality cuisine, and personalised service. KabuNohi Sorake meets the higher standard requirements of couples, families and discerning surfers looking for quality accommodation, the highest quality cuisine, and personalised service. It offers some of the best waves in the world and the opportunity to score the best waves of your life at almost any time of the year! KabuNohi Sorake’s underlying passion is surfing. Besides having one of the best rights in the world at your doorstep, there are numerous other surf options in the immediate area. Several of these locations may depend on your surfing/waterman skills but there are locations that work on variety of conditions. The main surf point is at Sorake in Lagundri Bay. Sorake is one of the premier waves on the west coast of Sumatra and many people consider it one of the Top 10 waves in the world. Lagundri Bay is protected by hills and large coconut plantations that direct and fan the offshores down into the bay. Historically Lagundri is little affected by any adverse winds, hence known to sailors as a good all weather anchorage. Sorake has consistent surf all year round but it’s the months between March through October when it shines supreme. 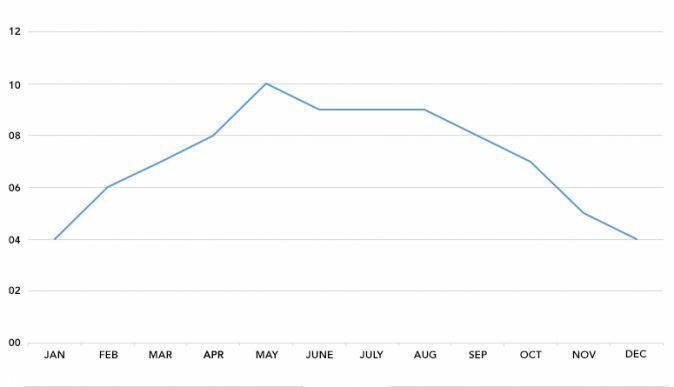 November to February is the “low surf season” with the outside point breaking less frequently than peak season although generally once or twice a week there are 3-6′ point waves on offer. On arrival in Binaka/Guningsitoli Airport you will be met by our staff who will handle your baggage and transport to Sorake. From the airport, it is a 116 km (+/-2hr.30 min) drive on a sealed road down the east coast road to south Nias. The drive takes you through quaint road side villages, plantations, jungle, and the tropical rice paddies. The last section you will come into the south is along the beaches and headlands, the port of Teluk Dalam and on into scenic Lagundri Bay. As you enter the front gate, you will arrive directly to The “KabuNohi Surf House”, built in the traditional south Nias style. The open plan ground floor houses the reception area, office, large and well equipped kitchen, an impressive bar and an impressive locally carved dining room table overlooking tropical gardens. Meals are served in this relaxing garden area; deluxe bungalow guests can opt to dine in the deluxe area. 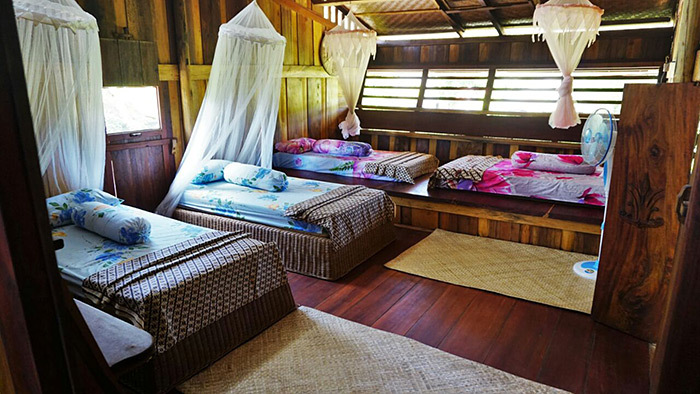 The first floor of KabuNohi Surf House is split between the owner’s private room on one side and a large guest room on the other side with a large open plan living room as the centerpiece as place for guests to relax. The KabuNohi Sorake property is 100 meters deep in length from the front gate (Sorake road) through to the ocean front. KabuNohi is aesthetically pleasing with the design of the gardens and buildings flowing with the natural surrounds and instilling a relaxed mood. KabuNohi Sorake Resort accommodation is currently offered in 3 categories, catering to most budgets: Deluxe Bungalows, Standard Bungalows and the KabuNohi Surf House. All bungalows are connected via wooden deck walkways on one elevation, wheel chairs can access all the property. 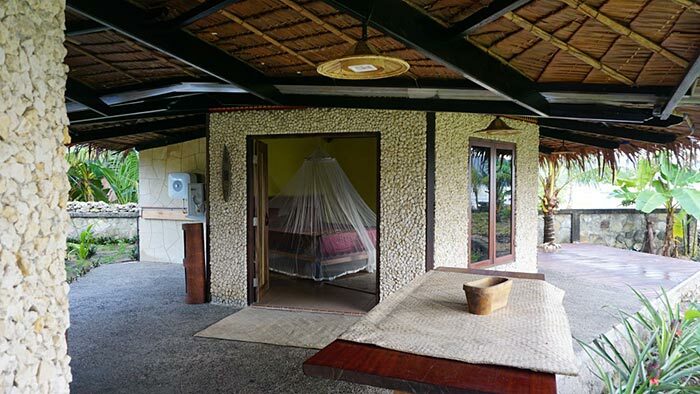 Bungalows are spread throughout the property and built to within 30 meters from a beach viewing platform. This maintains a privacy barrier and green buffer zone, here we have a walk way through our small garden of banana pineapples, root potato tropical trees and coconuts to the front surf view area. Bungalows are constructed with solid foundations and the strongest fixtures. Architecturally designed to with-stand the strongest winds and earth tremors. The unique thatched rooves with large overhangs were modelled off a traditional Nias hat and delicate hand carved features ornate throughout the buildings. KabuNohi Sorake is indeed a unique “handmade resort” and has provided employment for local builders, wood carvers and clever craftsmen during the original construction. There are two deluxe bungalows that offer panoramic views over the gardens and the bay beyond (Rice bowl section of the wave). 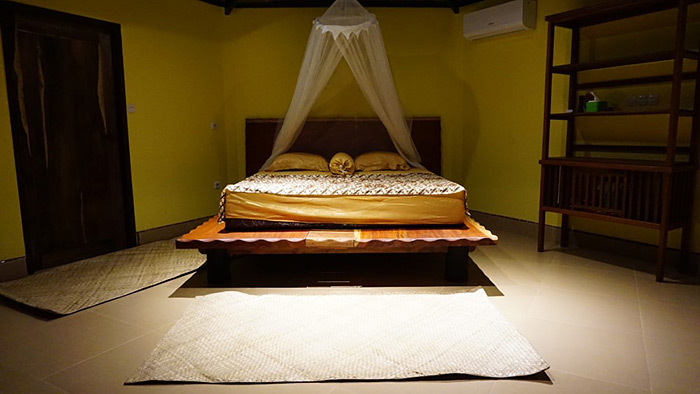 Deluxe bedrooms are 25 square meters with an attached private indoor/outdoor tropical bathroom. The handmade timber furnishings, decor and original artworks compliment the natural environment allowing guests to be instantly immersed in their own tropical hideaway as you enter the private and deluxe zone of the resort. A gate divides the deluxe zone from the standard bungalow area and there is a private kitchen area with fridge, drinking water, dispensing and tea/coffee making facilities for use by deluxe guests. Fruit and other snacks are replenished daily as well. The two standard bungalows are almost identical to the deluxe bungalows but only slightly smaller with 19 square meter bedrooms. Standard bungalows enjoy the same luxury tropical indoor/outdoor bathroom of the deluxe bungalows. These bungalows overlook the gardens and are in close proximity to the main bar/dining/kitchen/reception area where guests can help themselves to fruit, drinking water and tea & coffee. On the first floor of the main house is a large room that can sleep up to 4 guests in fan cooled comfort and features a double bed or twin beds and a bunk bed. Guests in KabuNohi Surf House have their own private bathroom with hot water and another dressing room area for luggage/clothes storage. This is very comfortable for single surfers or families on a budget looking to enjoy the KabuNohi Sorake experience at very reasonable rates. The centerpiece upstairs is a huge relaxing lounge area for use of KabuNohi Surf House guests to kick back and enjoy the ambiance of this traditional wooden building. KabuNohi packages are ALL INCLUSIVE of breakfast, lunch and dinner + fruit, snacks, drinking water, tea and local coffee. An emphasis is on high energy fresh food using the best ingredients with an amazing array of fresh fruits, vegetables and protein.Â Dining options include a varied, tasty and wholesome menu that will satisfy most people. Dietary requirements can be catered for if advised in advance. Dinner: A variety of hot and cold dishes, Fresh fish, Pasta, Veggies, Chicken, Salads etc. Food will be of the highest standard and will definitely be a highlight of your trip. No where in Nias will you find food quality of this caliber. 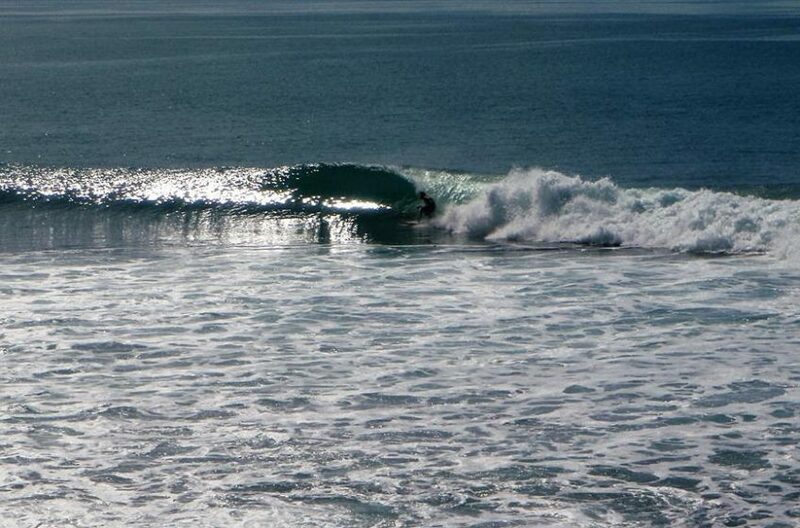 The resort has have local surfers who act as guides to accompany you on treks where and when you require! Nias has an old and colorful history, head hunting and slave trade was renowned in this region, the south of Nias was renown for hard warriors and dominating kings of the hilltop villages. The unique architecture of these villages can be still seen today. Botohili Village: In the immediate vicinity and within walking distance there are 2 traditional villages 500 meters up the back of the hill. Botohilitano is a village that assimilated/facilitated the first surfers onto being the traditional owners of the coconut plantations that grow on the Point. Hiliametaniha Village: A 40 minute walk down the point along Lagundri beach and up the hill (alternatively 10 minutes on motorbike) takes you to the traditional village of “Hiliametaniha” this village distance from the influence of tourists is still very traditional here you will literally feel like youâ€™re walking back in time, Hiliametaniha village also give you a fantastic view over Lagundri Bay “the Point” up the indicator reef to Sobatu bay. Bowamataluo Village: (Sun Hill) This is where the biggest king’ house that is said to be 200 yeas + old, this massive slab wooden building sits atop huge wooden poles. Bowamataluo Village is renowned for its cultural displays of war dancing and the famous stone jumping sport and the sun hill sunset. The Local Town of Teluk Dalam (Deep Harbor) has shops open every day except Sunday. Indonesian Banks with ATM machines that accept Visa Card. A trip to this town is interesting and if you need to buy things there is a traditional market as well as a small supermarket, prices in the shops are cheaper than what you find around Sorake. Villages, Markets, Waterfalls, Rice paddies Rubber coconut and cassava plantations. Walk or motor bike trek hill and dale from village to village on the old farm plantation tracks, these treks can be for a trip to the waterfall (1/2 day) or overnight staying in the village, we have experience local guides that can take you there! In Nias it’s mostly about surfing and the surfing lifestyle! Interestingly Nias is still a big surf village, and a part of the enjoyment here is that you can meet people from all over the world in a leisurely and friendly environment. One of the great things about the Nias is that the vibe has never changed remaining a surf camp atmosphere, Surfing the waves, enjoying some good times meeting with like-minded people, brought together in the search for the perfect wave. On small days (inside section usually low season) you can access the waves by walking a private path across the reef to the inside waves right in front of the property. When the point is firing the safest, fastest and most efficient way to access the point wave, is walk or jog from the front yard main gate along the Sorake Beach village road +/- 150 meters and walk across the reef via the keyhole crack in the reef. This crack in the reef allows you a safe entry from behind the wave and a dry hair easy paddle from the Keyhole to the main point, take off zone. It really is very easy, even on the bigger days. To exit the surf, you just catch a wave and prone in across the top of the flat reef to their step stone walk and our private beach path into the property. KabuNohi Sorake is a private resort with a unique view looking up the point at all the 3 sections of the wave. As for a reference in the equatorial regions and referring to a local Indonesian saying that any months ending in “er” i.e. : Septemb-er, Octob-er, Novemb-er, Decemb-er is referring to the Indonesian world for “bucket = Amb-er” so in the village you get your buckets ready, these months are the rainy ones! In general, these tropical rains brought about by the North-West Monsoon are a pleasant change from the dry season, rains are usually in the evening early morning or late afternoon, and these NW monsoons bring the perfect offshore winds for the Point in Sorake. On the Equator, the months of January, February, and March are hot and humid, evaporation of the tropical rain soaked into the soil makes it humid and hot, these times you can literally see the bamboo grow! March onwards the weather becomes dryer, with rain usually during the evening. Winds can be calm and steady, dictated by the intensity of the prevailing La-Nina to El-Nino and Indian Ocean Dipole of water temperature in the mass of the Indian Ocean. 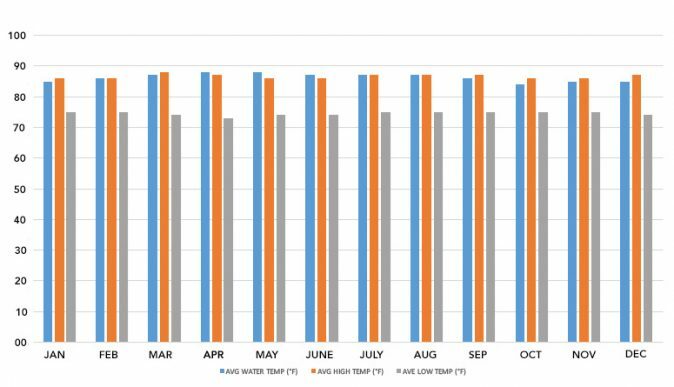 Nias can in times be affected by the southeast trades moving up onto the equator, (influenced by strong El-Nino) Or the familiar equatorial glassy calms with mornings of steady land drafts breeze from the summer weather patterns of the Northern Hemisphere. Portable Back up petrol generator to supply emergency power (240 volt) for lighting to building and walk ways at Front Office. In the case of any power failure or blackout, there is a rechargeable portable flash light in each room please note the position plugged into the power socket next to the sideboard of your bed. In the event of an earthquake /Tsunami warning! KabuNohi has an emergency response plan in place to ensure safety of Guest and staff. If in the name of an “event” or the possibility of a tsunami entering Lagundri Bay our emergency response plan will be implemented. Our location at the KabuNohi Sorake property is located on the main village beach road of Sorake and the intersection of the Road to Botohili Village 500 meters up the road. In an event Staff, will Muster Guest from their accommodation, a head count will be made at the Muster station (front Drive Way Gate), guest valuables Passport medication general requirements will be checked and secured, The KabuNohi emergency/supplies and response kits will be gathered. Guest will be led by staff to walk up the hill via the tar sealed road to the main Village and the Public gathering area. Time frame for emergency response evacuation is 15 minutes. Nias Island is generally accepted as safe and free from dangerous animals and reptiles. At KabuNohi Sorake we feel assured that you will not encounter any dangerous creatures or nasties, other than the harmless gecko, land and hermit crabs in the tropical beach side environment these are in abundance! Malaria and Dengue Fever are conditions and disease that are carried by Aedeses mosquitoes. These diseases are becoming less than common in our area. We keep our environment clean and free as possible from these hazards but exposure is often unavoidable. It is advisable to talk to your general practitioner before your travels to any tropical region and for short stays we do recommend Malaria vaccinations. Late evening, early morning and still conditions please use insect repellant or suitable clothing that will give protection from nasty and annoying insects. Please notify the manager if you see something of concern or you would like to question. Power outages are unavoidable here, these are generally for a short period only. Emergency lighting, a rechargeable battery torch is in the power socket on the wall in your room, feel free to use this torch but replace it to charge for standby in a power blackout or emergency. Backup generator we have a backup generator for main building /bungalow accommodation and basic lighting power requirements. Water supplies, KabuNohi has 3 sources of water; rain water, well water and spear point deep bore. Drinking Water is clean filter water, please to save on plastic waste we advise to use water that we supply from our dispensers to fill your drinking bottled water Dispensers are in the Main building breakfast bar area. Emergency response, In the event of minor accidents we have basic in house first aid. Within the vicinity, Lagundri bay and Sorake Village there are 3 small clinics that supply general practitioner medical facilities for minor situations. In local proximity (40 min+/-) there are 2 regional hospitals both these hospitals have ambulances, trained doctors. Nias Island has one major regional hospital in the north of the island at the main town of Gunungsitoli. This is a relatively new modern hospital this is a 2-3 hour drive away. You may have read about Nias in the past and drooled over imagery of the perfect right hander at Lagundri Bay but never ticked it off your bucket list. Prior to KabuNohi Sorake Resort the only accommodation options that existed were budget guesthouse/losmens with very basic facilities and food. Not really the type of place to take your non surfing partner or family and even a bit basic for a lot of surfers who have become accustomed to creature comforts of air conditioned bungalows, comfy beds, hot showers and excellent cuisine. Enter Mark & Debbie Flint, creators of KabuNohi Sorake Resort: your home away from home located smack bang looking into the eye of the incredible Lagundri Bay barrel. How do the packages work? KabuNohi Sorake is working on flexible check-in/check-out dates with a minimum stay of 5 nights. We will arrange flights from Medan to Guningsitoli (Nias) on the morning of your KabuNohi Sorake Resort, check-in and fly back to Medan early afternoon on the day of check-out from the resort. When should I fly into and out of Medan? When arranging your international flights, please note: You need to arrive Medan (KNO) the day before you check-in to KabuNohi Sorake Resort and depart Medan (KNO) no earlier than 6pm on the day you check-out from Kabunohi Sorake. We will arrange a VIP stopover package including 1 night in Medan at the 5 star JW Marriot Hotel in Medan and domestic flights to/from Nias. Your itinerary will work as follows (for those coming in/out of Medan): Day 1/Arrival to Medan (KNO): Meet and Greet by our rep on arrival and transferred to Medan Hotel *approx. 1hr drive. Overnight at JW Marriott includes full buffet breakfast, Day 2/Morning: Pickup from hotel and transferred to Airport for your domestic flight to Nias. Pick up is 3hrs prior to domestic flight time to arrive 2hrs early and get priority check in with our airport rep. * Note that for larger groups, you will be split up on the domestic flights to Nias in order to get your surfboards on the planes. The airlines only take a limited number of large surfboard bags* per flight. There are 5 flights every morning from Medan to Nias. On arrival into Guningsitoli, Nias you will be met by rep of KabuNohi and driven to Sorake Beach, Lagundri Bay approx. 2hrs 45mins drive. Stay at KabuNohi Sorake Resort (min. 5 nights). Check-out day: Early Morning Surf and breakfast then transfer back to Guningsitoli Airport for flight/s to Medan. Once again larger groups will be split over several flights in order to get boards on. Met on Arrival into Medan and transferred to hotel. * We do recommend an overnight in Medan on your return, just in case boards don’t arrive on same flight, flight delays occur etc. You will arrive home feeling fresher also by breaking up your journey rather than trying to do all in one continuous journey from KabuNohi Resort to home. You will enjoy your last night of your trip in luxury at the JW Marriot before heading back home the following day. Final day: Buffet breakfast and pickup/airport transfer from JW Marriot hotel, approx.3.5 hrs prior to your international flight departure. * However if you would rather just get home withou another overnight stop in Medan, there are international flights in the evenings from Medan to Singapore/Medan/Jakarta. What are the regulations regarding board bags on domestic flights from Medan to Nias and return? DOMESTIC FLIGHTS TO/FROM NIAS WILL NOT UPLIFT SURFBOARD BAGS LONGER THAN 200CM OR 6’8″. YOU CAN TAKE UP TO 3 BOARDS PER BAG (SURFBOARD BAG WEIGHT MAX. 23KG*). FOR SURFERS WISHING TO TAKE LONGBOARDS OR BOARDBAGS OVER 6’8″, YOU MUST CONTACT US TO ARRANGE OVERLAND TRANSPORT FOR YOUR BOARDS FROM MEDAN TO NIAS AND RETURN. NOTE THIS WILL ADD EXTRA TIME AND COST TO YOUR TRIP BUT IT CAN BE ARRANGED. **KABUNOHI SORAKE DO PLAN ON HAVING A FEW LONGBOARDS AVAILABE FOR RENTAL * NOTE: Wings air charge an extra RP200,000 per surfboard (approx. AU$20) per board each way – e.g. : 2 boards in bag you will need to pay RP400,000 (Approx. AU$40) each way – payable directly at check-in. General Health and Safety: Nias Island is generally accepted as safe and free from dangerous animals and reptiles. At KabuNohi Sorake we feel assured that you will not encounter any dangerous creatures or nasties, other than the harmless gecko, land and hermit crabs in the tropical beach side environment these are in abundance! Mosquitoes /Malaria / Dengue and general hazards: Malaria and Dengue Fever are conditions and disease that are carried by Aedeses mosquitoes. These diseases are becoming less than common in our area. We keep our environment clean and free as possible from these hazards but exposure is often unavoidable. It is advisable to talk to your general practitioner before your travels to any tropical region and for short stays we do recommend Malaria vaccinations. Be advised in best practice: Late evening, early morning and still conditions please use insect repellent or suitable clothing that will give protection from nasty and annoying insects. Our grounds are monitored daily for hazards so please notify the manager if you see something of concern or you would like to question. Indonesian Visa on arrival: Most nationalities are now issued with a free 30 days visa on arrival into Indonesia. You must have a minimum of 6 months validity in your passport from your date of arrival to Indonesia. Spending money: KabuNohi Sorake works on cash only at this stage and preferably payment by Indonesia rupiah. You won’t need a lot of cash but will need cash for beers, soft drinks/mixers (you can BYO Duty free), souvenirs etc. On arrival into Medan on Day 1 we recommend you go to the official money changers just outside the arrival hall. Our airport rep will point you in the right direction here. Best to change your local currency AU$ into Rupiah Cash. There are also ATM machines at airport and in Medan that will work with most international bank cards. On Nias there is ATM at TelukDalam (20 mins drive from KabuNohi) and this can work in a backup situation however it is advisable to get RUPIAH CASH in Medan prior to flying to Nias. Earthquake Tsunami Warning: The hexagonal shaped rooms are of strong design and built with reinforcement our roofs are of light weight construction. We do not envisage that there is a great possibility of any of the building structure to collapse but in saying this; if you feel a large and increasing earthquake we advise that you leave your room and proceed to congregate in front of office drive way gate area. Their staff will monitor the situation and advise on conditions and strategy. In the case of any power failure or blackout, there is a rechargeable portable flash light in each room please note the position plugged into the power socket next to the sideboard of your bed. Note: Indonesian hand phone numbers usually receive an earthquake warning message that gives the current warning and possibility of tsunami status. Emergency Response and Tsunami Evacuation: In the event of an earthquake /Tsunami warning! KabuNohi has an emergency response plan in place to ensure safety of Guest and staff. If in the name of an “event” or the possibility of a tsunami entering Lagundri Bay our emergency response plan will be implemented. Our location at the KabuNohi Sorake property is located on the main village beach road of Sorake and the intersection of the Road to Botohili Village 500 meters up the road. In an event Staff, will muster guests from their accommodation, a head count will be made at the Muster station (front Drive Way Gate), guest valuables Passport medication general requirements will be checked and secured, The KabuNohi emergency/supplies and response kits will be gathered. Guest will be led by staff to walk up the hill via the tar sealed road to the main village and the public gathering area. KabuNohi Sorake packages work on flexible check-in/check out dates with minimum 5 night stays. One night in each direction (pre/post KabuNohi stay) is required. You need to arrive Medan (KNO) on the day before your KabuNohi Sorake Resort check-in and depart Medan (KNO) the day after you check-out of the resort. All meals including snacks, unlimited filtered drinking water, tea & local coffee. Surfer packages include services of a local surfguide for personal intro to the main break and guided trips to other breaks within 1 hour drive. * Boat trips at additional cost arranged directly at the resort. Deluxe Bungalow packages can be booked as: Single -Sole use, Double/Twin share, Triple share or with 2 Adults and 1 child (max. 1 child and 1 infant) per bungalow sharing with 2 adults. Standard Bungalow packages can be booked as: Single -Sole use, Double/Twin share, Triple share or with 2 Adults and 1 child (max. 1 child and 1 infant) per bungalow sharing with 2 adults. KabuNohi Surf House package: For families looking for a more affordable option, take SOLE USE of the KabuNohi Surf house by paying for a minimum of 4 spaces (eg: 2 adults/2 kids). The main surf point is at Sorake in Lagundri Bay. Sorake is one of the premier waves on the west coast of Sumatra and earns a top 10 rating in the world’s best waves. Lagundri Bay is protected by hills and large coconut plantations that direct and fan the offshores down into the bay. Historically Lagundri is little affected by any adverse winds, hence known to sailors as a good all weather anchorage. Sorake has consistent surf all year round but it’s the months between March through October when it shines supreme. 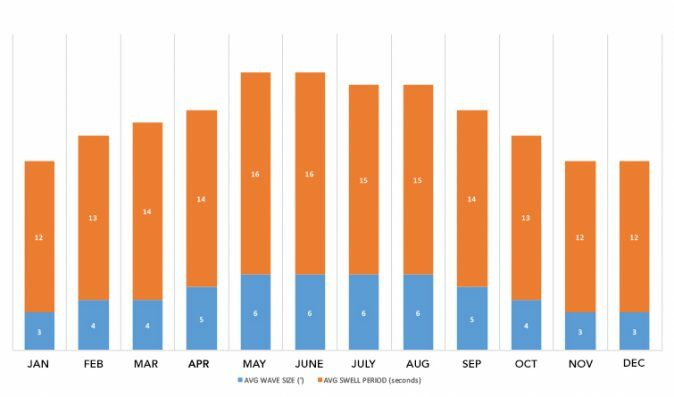 November to February is the “low surf season” with the outside point breaking less frequently than peak season although generally once or twice a week there are 3′ – 6′ point waves on offer. During the low season, Kiddies corner really comes into its own. The grommet and older guy’s paradise! Here is a small wave that runs perfectly down the line, hugging the reef and if linked it can serve up long rip-able walls of fun with rides over 100 meters long. For the short board rippers, this little wave machine is one of the most rippable waves anywhere. For older mellow surfers who travel with a fun board, they will have hours of fun trying to link the sections together. It's very easy to access/exit with a very short walk up or down their private beach track at KabuNohi Sorake. This is a small right and left peak right at the end of Kiddies corner, short shallow and tubing. When this starts breaking the up and coming mini grommets locals are on. Rice bowls is a good sign that there is movement in the swell. It breaks directly out the front of KabuNohi Sorake and provides great late afternoon entertainment from the surf deck whilst enjoying a cold Bintang. The iconic wave is Nias is nicknamed ‘the keyhole section’ as when it’s working you paddle out a Keyhole in the reef at the back of the wave. From the keyhole, it is a 50-meter paddle to the take off. Here you can surf from 4 to 15 foot waves that break consistently, with predictable sections. The water depth is even and the reef is relatively flat. Current is nil most of the time and tidal variance is very slight apart from full moon. The wave is fast and powerful and offers a perfectly formed high tubing wave. Our KabuNohi local guides will give you a personalised introduction to the Point and take you out through the Keyhole and then give you the vital landmark pointers (Coconut trees etc.) so you know if you are sitting too deep or not out far enough to avoid the clean up sets. The guides will give you some vital pointers on the wave itself and the best way to approach it. Local surfers in general are very friendly if you have a chat with them and don’t be greedy and wait your turn. They will call you into set waves if you are cool in the water. Your turn arrives and you’re in prime spot for a set wave! Put in that extra stroke and enter with speed and you’ll be set for the ride of your life. Often you should take the high line rather than do a deep bottom turn. This high-line could set you up for an exciting barrel or you might be racing to get through to the next section where you’ve got some time to drop down and draw out a nice bottom turn and smack the lip before launching into the end section which will often throw out a nice almond barrel that spits you out into the channel. On smaller days it may not barrel as much however it becomes a very rippable high performance wave and you may even be able to milk it and fade back to connect with Kiddies corner and take another 100m of skate park through to the rice bowl…now that’s a big paddle back to the Point but well worth it. Unlike other Indo breaks, The Point breaks in deep water and it would be very rare to touch the bottom even if launched over the falls. If caught in the impact zone you can change direction rather than try and paddle through it and head for the deep water of the channel and back out to the point, being careful not to cut it too fine and cop a wide set on the head. Once again, The Point is so easy to enter the surf zone via the Keyhole and exit the surf by a prone out on a wave and heading high up the reef to head in the direction of KabuNohi private walkway back into the resort. There is a fresh water shower at the top of the steps. You are likely to get the barrel of your life here and more than likely have a photo to prove it as we have local photographers lined up to shoot your sessions and offer you a photo package at a very reasonable price. The picture-perfect wave that peels down the outside point letting you know that the sets are focused on the point! Paddle and take a right turn out of the main break “Keyhole” before and watch this mesmerizing wave peel down the shallow reef. It is advised to best watch the locals here because if they are paddling out it’s a good sign that the swell angle is good. Indicators breaks perfectly on a shallow reef edge. A walk up around the point to this challenging wave for experienced surfers only, usually a mission here is well planned and documented. 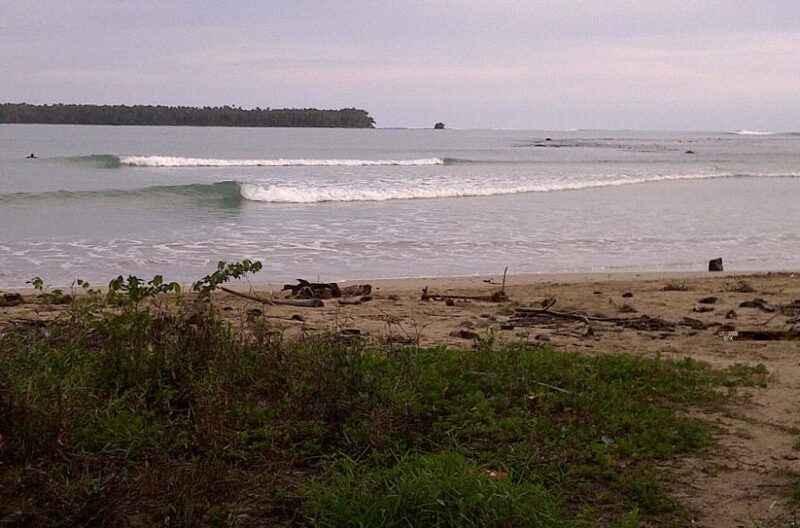 The resort has a speed boat available for strike/photography missions to Nias’s heaviest and most challenging wave. With the right direction in the swell and favourable winds, the guides can arrange a car and take you to Rockstars right for a session. A 45 minute drive along the east coast will get you there. An easy paddle out through the bay to a mechanical righthander that will throw you a few barrels and have you grinning from ear to ear. The Lagundri Beach river mouth has a perfect small wave where you can quickly learn the basics of surfing in safety. Lagundri has a board hire and instructor boards are “Soft Tops” especially for learning on. The Lagundri Beach river mouth can also offer a cracking right-hand beach-break if Main Break is big. This keeps intermediate surfers happy when the “point” is firing and too big.